This men's Accurist analogue and digital watch offers classic style with ultimate functionality. Featuring a stainless steel case and bracelet with a black dial, this timepiece is your perfect assistant to everyday life. This watch is also water resistant to 50 metres. 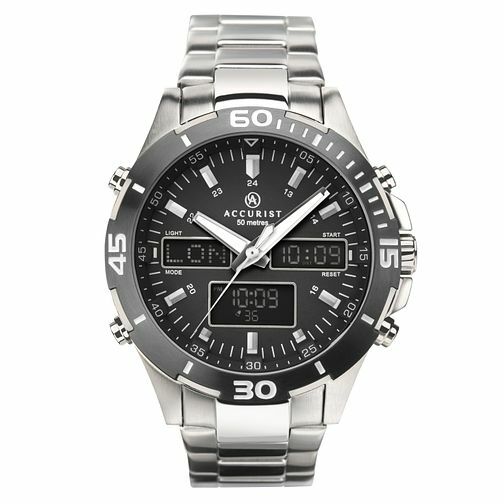 Accurist Men's Stainless Steel Analogue & Digital Watch is rated 5.0 out of 5 by 1. Rated 5 out of 5 by Anonymous from Great Value Watch Its the best looking s/steel watch for the price..Looks better than anything else I looked at up to £500.